ONE of the most data-driven sports on the planet is gearing up to protect the interests of its teams in a bid to come out on top on the track next season. When thousandths of a second can make the difference between success and failure, it’s no wonder Formula One teams are fuelled by a desire for secrecy, partly driven by memories of historic espionage controversies. Ironically, the latest team to strike a deal in the dizzy world of data is one of motorsport’s most successful which has just suffered a season of despair, promising changes aplenty. Williams Martini Racing has just announced a new technology partnership with Acronis, a global leader in hybrid cloud data protection and storage. As part of the agreement, Acronis will deliver innovative data protection solutions, including back-up, disaster recovery, software-defined storage, and file sync and share. Formula One is one of the world’s most technologically-advanced sports. At every Grand Prix weekend, teams capture hundreds of gigabytes of telemetry data, and produce terabytes of engineering and test data in the garages which transfer instantly to their factory bases. Data analysis fuels innovation and technological development. The ability to interpret the data and make informed decisions is often what sets teams apart, making it the most valuable asset, one could argue, in the race towards the finish line. Acronis says its expertise in data protection will assist Williams deal with the growing volumes of data without compromising the security and flexibility mandated by Formula One. Through its partnership with Acronis, Williams will be able to access a full set of innovative data protection solutions. “Technical innovation is at the heart of everything we do at Williams, and with that comes a crucial need to protect our data,” said Claire Williams, deputy team principal, Williams Martini Racing. At the recent Abu Dhabi Grand Prix, GulfWeekly met up with Clare and Serguei Beloussov. Serguei, known to his buddies as SB, is a charismatic Russian-born multi-millionaire boffin, founder and CEO of Acronis, who has lived most of his life in Singapore where he set up the company in 2003. It was incorporated in Switzerland in 2008 and now boasts more than 1,000 employees in 18 countries. To mark its 15th anniversary, the software company expanded its ‘commitment to knowledge’ by establishing a non-profit foundation that supports initiatives designed to foster education in order to gain and protect knowledge which includes building schools and helping recently-released prison inmates increase their chances of employability. “All evils are caused by insufficient knowledge,” the 46-year-old father-of-seven said. Speaking from a location in the Gulf region enriched by the discovery of oil, Serguei described ‘data as the new oil’. British motor racing engineer Paddy Lowe, previously executive director of the invincible Mercedes F1 team, is currently the chief technical officer at Williams Martini Racing. After what has been an ‘annus horribilis’ for the team, 2019 could see a change in fortunes with the fairy-tale F1 comeback of Pole Robert Kubica, whose right arm was seriously injured in a 2011 rally crash, joining young British Formula Two champion George Russell in the driver line-up. On the technical side a problematic aerodynamic stall at the diffuser will have been resolved and a season full of secret data will help to determine a fresh approach. “We’re very excited that we have two new drivers,” Paddy said. “A combination of a talented rookie and a legend of the past in Formula One with all the experience he brings. “On top of that we have a new car and a new set of aerodynamic rules which give us a great opportunity. We want to be an independent team that can win the championship and we are starting now to build the foundations to do just that. And, it’s not the first connection with F1. Acronis also has an official data protection technology partnership with the Racing Point Force India team who next season will be known as Racing Point F1 . The company already provides backup, disaster recovery, software-defined storage, file sync and share, and artificial intelligence-based ransomware protection to the team’s factory, wind tunnel and trackside IT infrastructure. As part of the agreement, the Mission Control Room at the team’s UK factory in Silverstone, was named ‘Acronis Mission Control Centre’, signifying the value of data and importance of data-protection in the sport. As soon as the cars hit the track, the control centre starts receiving a live stream of data, allowing engineers and race strategists to run simulations and feed information back to the drivers. The control centre also maintains real-time contact with the engineers at the pit wall, providing help and extra information during the races and between sessions. And it’s not only motorsport. 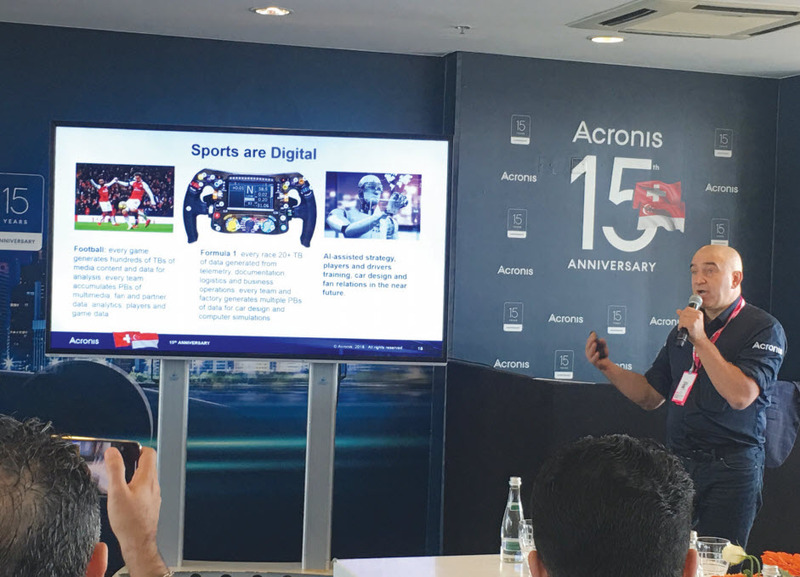 Acronis has formed a technology partnership with the Premier League North London giants Arsenal to provide data protection to the club’s growing IT infrastructure. Developing a winning game plan means recording and analysing the number of passes within certain areas of the pitch, touches in the opponent’s box, goals scored off set pieces, and more – all of which are factors that are meticulously studied before, during and after every match. Acronis also provides secure storage of every first-team and academy training session recorded at the club’s training ground – which amounts to 8TB of data a year, the equivalent of 875 matches. During the weekend in Abu Dhabi the company also welcomed Manchester City on board with former star Paul Dickov coming along to the party with the Premier League trophy. As part of the partnership, Acronis will help the Premier League champions to enhance and develop its data backup and storage capabilities. Technology, data in particular, is increasingly important to teams in this ever-developing digital age. So much so, that during the days leading up to important matches, data is available through iPads in the City locker room so that players can review historical data with their coaches and make last-minute adjustments to the playbook. It is also vital for the team to analyse data in their post-match analysis. As SB said, data is the new black gold and trophy-winning and money-spinning success for all teams it appears will be determined digitally. In top-flight sports, team and competitor analysis is growing more important than ever to gain an upper hand over the opposition.